For these last few days leading up to the yummiest holiday of the year, we’re sharing great tips for making your Thanksgiving centerpiece the talk of the table. Yesterday’s post was about creating an anchor point to help start your centerpiece design. Today our visual design expert, Shelley is going to elaborate on that a bit. Conversations around a Thanksgiving centerpiece. What’s most important is that your friends and family enjoy making memories around your Thanksgiving dinner and that centerpiece in the middle. Conversations around the Thanksgiving dinner table can be quite interesting. There might be friends who don’t know each other well, or family members that don’t see each other too often. No matter what the conversation is, let’s make that Thanksgiving centerpiece something worth talking about. When you are choosing an anchor point, think about the size and shape of your table. Do you have a round table or square? Is it a long rectangular table where lots of people will be sitting around? 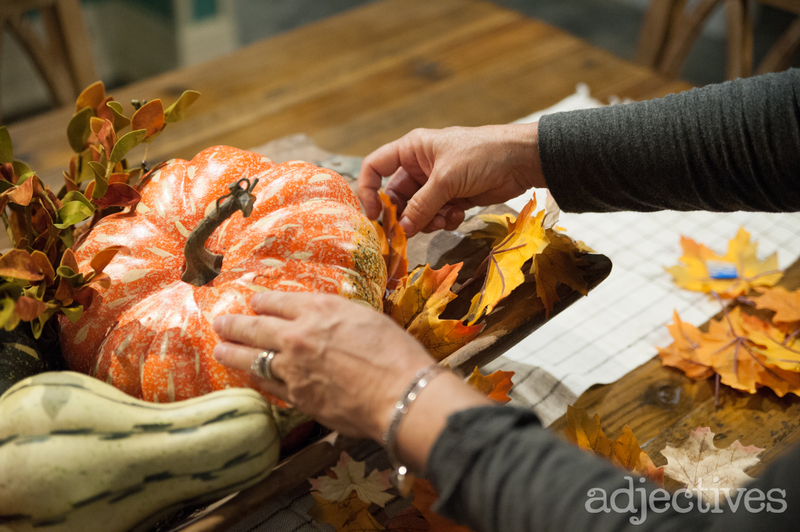 These next few tips will help you really define that perfect anchor point and begin visualizing your unique Thanksgiving centerpiece. Shape and size does matter. Once everyone is seated and the table is full of great food, plates and glasses, you’ll want that centerpiece to stand out without taking up too much room. You don’t want too small of a centerpiece on a large table or too large of centerpiece on a small table. If you have a small group gathering around your dining table this year, your centerpiece could reflect your table size, but not necessarily it’s shape. Is your table round? Consider creating contrast by deliberately designing a Thanksgiving centerpiece that is square to offset the shape of the entire table once it’s decorated. 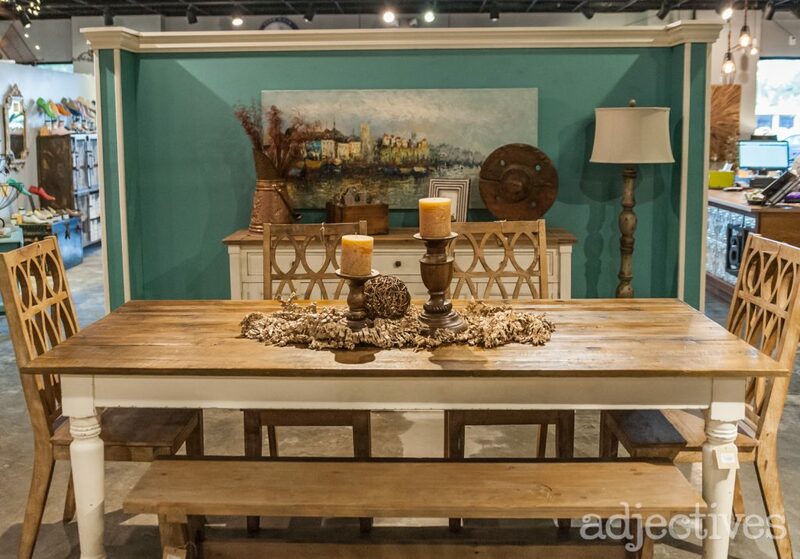 If your dining table is large, long and rectangular, your centerpiece shouldn’t be small. Check out this oversized, antique dough bowl. Just because of it’s sheer size and great shape, it’s a perfect anchor point the centerpiece on a large rectangular table. Keeping with the the rectangular shape of your table, use this opportunity to find an anchor point that is proportional, yet simple. This way the attention will be on what’s inside the anchor point. Creating balance isn’t necessarily about having perfect symmetry. Asymmetry is actually easier to work with, and makes for a much more interesting centerpiece design. This dough bowl isn’t even straight! 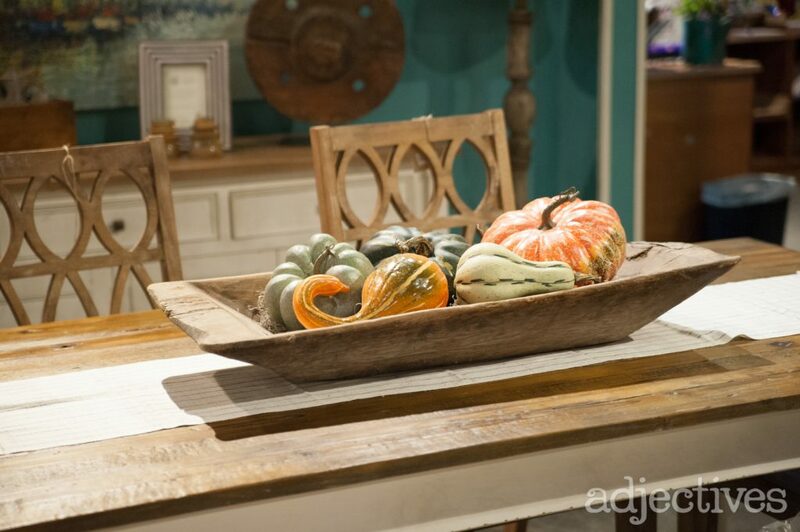 Don’t you love how that emphasizes the organic look of this Thanksgiving centerpiece? Working with odd numbers, or unbalanced objects actually creates balance! We’re all about avoiding conformity here at Adjectives and that’s easy to do when you work with groups of 3 or 5. Consider using three smaller centerpieces on a large rectangular table. Shelley has used three small galvanized tins to spread out the spacing of the anchor point. Don’t feel like you have to stick with the same objects either. Notice how you can also use two different size candles sticks and a low lying natural wood object to emphasize the centerpiece with asymmetry. The height of your centerpiece is really important, especially at the dinner table. It’s even more important when your making memories with family and friends at the best dinner you’ll have all year! Although centerpieces can be gorgeous when elaborate and tall, it’s best to keep your Thanksgiving centerpiece low to the table. What we love most about this wonderful gathering is that everyone can actually see each other and enjoy the conversations going around the table. You can’t do that naturally if your centerpiece is too tall. The last thing you want is a centerpiece that everyone is sliding back and forth or having to lean around to talk to each other. Make it easy for everyone to enjoy conversation while also enjoying the beautiful centerpiece they’re talking over. Again, we love how Shelley has used this low-lying dough bowl and kept details to a minimum in this Thanksgiving centerpiece design. Keeping your centerpiece low in height might stifle your vision for something amazing and beautiful – but have no fear! 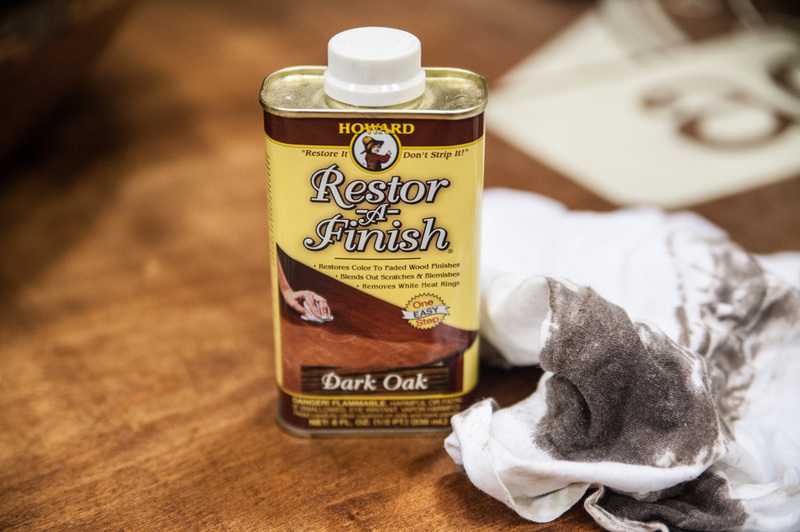 We have some amazing tips for filling your anchor point tomorrow. 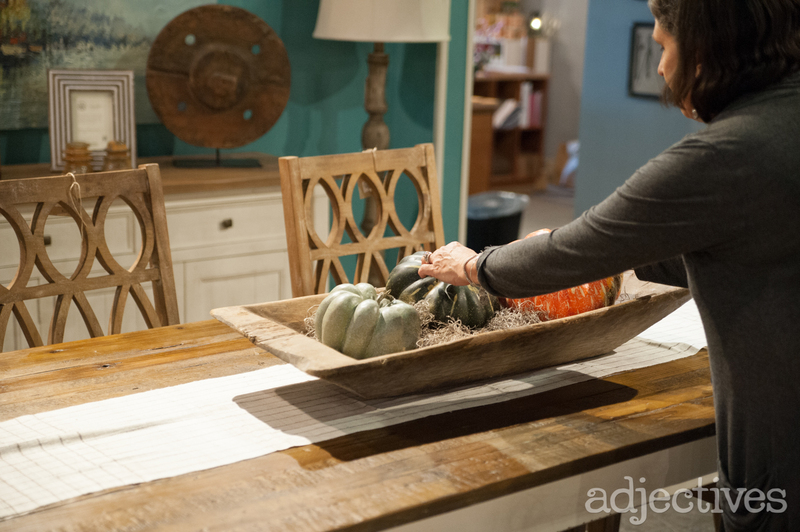 Using natural, yet unique elements we’ll show you how to add volume and style to your Thanksgiving centerpiece.